It is kuku time ! Welcome and have a kuku time in a kuku land. This is a place where everything seems a bit kuku but is actually True! If you are open-minded person and have a heart for seeking the truth in life please come and visit this site or any of our affiliate or partner. But I warn you! My blogsite is titled “Critical Review Brutally Honest”. I will tell you this if you have a faint heart and not up to it, please be warn! Well everything in here, we try to be brutally honest and we held nothing back. We don’t spare any feeling for the sake of truth. Worst of all I am a dictator in my blogosphore and everything goes my way. I don’t tolerate people who don’t understand this simple concept. This blog has been established since 2003 and we are still going strong. We are still strong as ever even the same policy. I am a Muslim, very conservative and would like the people to return to the true teaching of Islam. Base on the true teaching of the Holy Quran and Sunnah. There is simply no place for hypocrisy and any racist or keris waving sentiment. I will use all power to stop any attempt of the liberalist movement like Sister in Islam or Progressive Islam in trying to hijack and sub-serve our scarce teaching of our Prophet Muhhamad(PBUH). We will also try to educate and tell people the truth of Islam instead of falsehood that is trying to be portrayed by Jewish control media. We also monitor the injustice that is being genocide of our fellow brothers in Palestine by the apartheid regime in Tel Aviv. Here is our sister site in our network that deals with this specific issue directly. It is call Israel Watch and we monitor their dubious and evil activity going on around the world. Also we promote the true Monotheism, which is known as Islam. We never accept any psuedo concept of Monotheism like Trinity. Where one is never one but one is three but three is still three? We strongly oppose any attempt by the Christian Ministry in trying to spread this obvious blasphemy. Which never make any sense to begin with. --> http://www.menj.org " Critical but not Kuku." Sorry for the lacks of either update or reviews or even anything silly. I am quite busy and have lots of work right now which mean I having problem updating regularly. By the end of next week, hopefully I can be free again. Have a nice day! This Post will be deleted when the next post is out! We will be posting some more posting that we will hope to turn out fantastic! We still have many more topics to go. So Please stay tune! Thanx for Mr. Santos. If you have any suggestion on any improvement your are welcome to comment! Welcome to your friendly neighborhood! Hi, This is Me, your friend Bert! And This is Our happy friend, Ernie! Nice to meet you here! We are your friendly neighbor. We live at a place somewhere in Sesame Street. Why don't you come and don't stay along! PLEASE DON"T CONTINUE TO STAY AND READ! Two famous puppet our children or our childhood most beloved character! Ernie Loves to play with his ruby ducky while Bert he likes birds, he really loves them that much. They are roommate, best of friends and buddies. The kind even after so much argument and fighting but you know will never let you down when things matter the most. Now, these boys are the product of the Children Television workshop funded and broadcast by the Public Broadcast system PBS. As aspected they both represented themselves with the best interest of both the children and their parents. This is a true model how a really good, innocence and pure child should act and behave. The right attitude, behavior and act! With No political agenda and No social re'programming'! No new age kinda of thing! So Mommy and Poppy, Please don't worry Your child is safe with us. Our Product is good and wholesome. until....Okay kids! it is time for bed ....This is 'forbidden'!!! In 2002 at the Sundance Film Festival, our friendly duo were now in a bigger crisis. A crisis of a different nature, a social nature. These innocent child-like Muppet has suddenly became gay. Here is the video bellow. it is banned by the CTW. It became such a crisis that CTW had to put a measure to stop this. This video has been court order to stop and banned all of it's distribution. Now is Bert and Ernie is really Gay??? No off course... They are not gay because they are Muppet! So say the Children Television Workshop. But of course a children product can never contains such filthy content. directly at least. 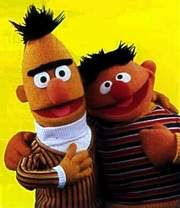 So did CTW really wanted to hint to children that Bert and Ernie was actually a secretly gay couple? A hint of this? Picture of Gay hinted Ernie! Now, do our children need to be bombarded with all this social propaganda? Isn't it enough that as adult we have enough of things being shove through our throat? Why do your children need to learn such value that maybe against your natural value? Do you feel your value are not adequate enough that you need some 'public' entity to decide what is best value for your children for the beginning! Now, children are always a product of a heterosexual relationship. hopefully sometimes a good one but sometimes misfortunely a bad one. A gay homosexual couple could never produce a children no matter how they try or no matter how faithful they are. It is simply against nature. It just cannot happen in the Animal kingdom of a gay couple producing and rearing a young one. Trying to portray Bert and Ernie as a faithful Homosexual couple is an oxymoron actually. Did you know that gay homosexual peoples who are among the most those who have the most multiply partner? It is not a surprise that such a hedonist culture will only care for the best interest of themselves not your children! So why all the fuss? Were all this been program from the beginning. Do society needs to be re'programme' by such a program. A program to make children to accept social agenda that are harder to be accepted by the older generation? A hidden plan to re engineer your thought of your kid? At the current moment No one can really conclude anything concretely. But maybe they just simply seem as two happy boys who are just simply genial, joyous and happy but not gay! CTW or PBS! if you ever step over the line and try to do anything silly and shove our throat, like planning any social agenda then truly we know how evil you are. And Folks, don't ever let your children alone to see such crap all hour long! Any question on Gayness please address to them yourself. But Feel free to kindly or unkindly to comment here! The Pope has one but doesn't use it. Jerry Seinfeld is very, very proud of his! What is it? click the comment and answer! The Most horrible Clown of the weekMonth! The clown of the week! Congratulation! Encik Radzi Sheikh Ahmad! The Home Ministry of Malaysia! Why is he a clown? Because he believe the people are silly! He believe that the Ministry don't need to fulfill their own promise! He believes it is the people responsibility to be a cow to do what they are to told. To give a car and other prize to lucky winner for the new ID(IC) register! No car, no prize just shut up! We will do what we like with the prize. Our Home Ministry promise are no good but I am in charge here! He who hope to win a Myvi(car) should just hope to obtain a Mykad(ID card)! You Mr. Radzi Sheikh Ahmad are Most Horrible Clown of the week! How ,What and Why to Kuku?